Standarts of Decision-Making Across Cultures is part of the Elite Network of Bavaria. The programme can only be started in the winter term. The next application deadline is June, 15th, 2019. 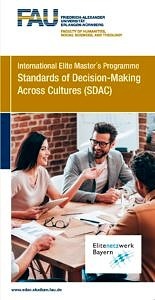 Standards of Decision-Making Across Cultures (SDAC) is an interdisciplinary study program that allows the students to acquire profound academic and methodological knowledge, as well as additional key skills regarding decision-making processes in East Asia. The MA degree program requires a BA degree of variable disciplinary orientation. Students may choose their academic focus (linguistic-cultural, comparative-philosophical, cultural-religious) by selecting accordingly from the courses offered at the FAU Erlangen-Nürnberg as well as the ECCS in Beijing. During their obligatory stay at the European Centre for Chinese Studies (ECCS) in Beijing, students will be given the opportunity to apply their theoretical knowledge to both academic and everyday situations in China. The program is organized into four semesters. Students must acquire a total of 120 ECTS credit points. The Master’s thesis is due at the end of the fourth semester. The study plan includes lectures (including the IKGF lecture series), seminars and tutorials. All courses are held in English. For a detailed description please refer to the Homepage of the program. Students are required to spend their third semester at Beijing University (European Centre for Chinese Studies (ECCS) as no environment suits the purpose of learning Chinese as a foreign language better than China. Teaching is carried out by experienced language instructors who teach their classes almost entirely in Chinese and encourage students to speak, read and write from the very beginning of their stay. As one of China’s most prestigious universities, Beijing University is home to a great variety of study subjects and research fields. This is reflected in the teaching provided by the respective institutions on campus. Although most classes are not accessible for exchange students, the ECCS will prepare a list of classes for every term. It will comprise a variety of courses with different subjects (mainly in English and mainly from the fields of humanities and social sciences) for students to choose from. During their stay at the European Centre for Chinese Studies (ECCS) in Beijing, graduates learn to apply their theoretical knowledge from the first phase of the degree program to academic and everyday situations in China. Students shall acquire profound academic and methodological knowledge, as well as additional key skills regarding decision-making processes in East Asia. Over the course of the degree program, students receive profound insights into the processes of decision-making, e.g. in entrepreneurial, political, and cultural situations (rational choice theories in particular). They will develop a new cross-cultural perspective on decision-making processes, utilize their knowledge in an interdisciplinary context, learn to approach research questions from an academic perspective and to cultivate their independent thinking. These qualities will eventually enable them to delicately deal with intracultural and cross-cultural decision-making processes. The acquired knowledge from the fields of sinology, history, philosophy, religious studies, economics, social and cultural anthropology, and the history of science will enable them to gain skills in the fields of communication and critical thinking, as well as to work in an independent, solution-oriented, critical, analytical, and application-oriented manner in various professional circumstances requiring expertise from humanities, area studies, and social sciences. The specific expertise opens job perspectives for the graduate in professions concerned with culture, politics and business, as well as in intercultural work environments where the aforementioned fields of study intersect. Graduates will be capable to take a culturally sensitive and discerning stance when participating in real world decision-making, both in an international and specifically Asian-European context. Their skills and expertise to operate in an international environment qualifies them for leadership positions. For further information, please visit our homepage or contact the Program Coordinator, Anna Schneider (anna.schneider@fau.de).